As mentioned in previous gear reviews, I'm not exactly on the cutting edge. It doesn't really matter. Most of this stuff hasn't been written about in many places, so this review might still be helpful to some people. Tackle-wise, I didn't change much. In terms of soft goods, I liquidated and started fresh. Anyhow, here are my thoughts on some of these products. It felt like it took me forever to finally use this reel, but it was worth the wait. I bought too many reels this year. Most were impulse purchases, like the Abel Super 8 I bought and sold without ever using. Others, like a pair of Islander reels, were products I already owned, but wanted in different sizes. I got a great price on a used Islander LX 3.8 and moved it to my Sage Z-Axis 6wt. switch rod. I also bought a used LX 4.0. I haven't even cleaned the old line off of it yet and I don't have a definite use in mind at the moment. I know I like Islander reels, so I bought it when I found the right price. Impulse control...I'd like to say I'm working on it, but I'm not. Unlike the Islanders, the Abel Classic Switch Reel was new to me. I had so much fun with my Islander IR4 in the spring, I decided to go the click and pawl route for my Ross Reach 11'9" 7wt. Unfortunately, it took forever to get enough water in the river to use this combo. One of my clients actually landed a salmon on this reel before I had the chance to fish it myself! Once the water came up, I was in business. It is a very sturdy reel and it has a full cage frame, so thin running lines will not slip between the frame and spool. 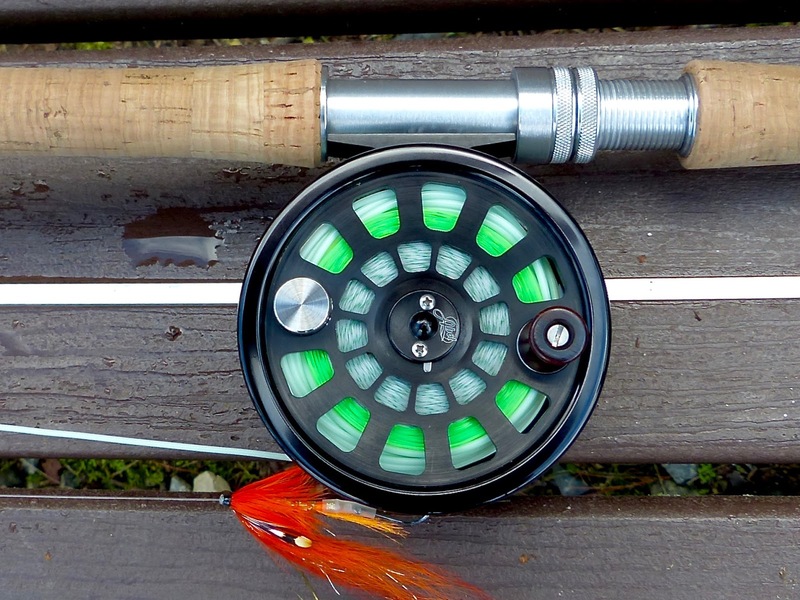 This reel has a very meaty "growl." I'm not crazy about the sound when I peel line off, but my opinion changes when a fish pulls line off for me. I'm not ready to convert to click and pawl only, but I will probably hang on to this reel. It is a lot of fun, well built, and easy to maintain. 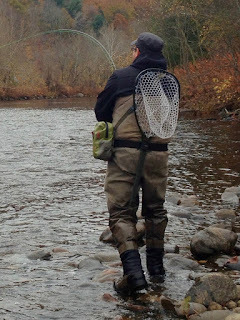 I tested this rod out a couple of years ago at the New England Spey Clave. Instantly, I knew I wanted it. The only problem was the price, which is just too much for me. Two summers ago, I got a good deal on a Sage TCX 7126, aka the "Death Star." It was a fussy rod, but I managed to get the feel for it after a few practice sessions. Anyhow, the opportunity came up to make a square trade...my Death Star for the Sage One 7126 in similar condition (virtually mint), so I jumped on it. It felt as sweet as it did back when I first tried it out. It's very light and responsive. I paired it with a Danielsson L5W 8twelve and a 475 gr. Beulah Elixir. I haven't really put it through its paces yet, but I expect I will in the first half of 2016. I will report more on this rod later this year, though there are plenty of Sage One reviews out there already. I am a recent Fishpond convert. I have been aware of Fishpond for a while, but never bought any of their products until late 2015. I bought an older model of their Westwater Guide Lumbar pack in Cabela's Bargain Cave (reviewed here by my friend Steve Zakur). The first thing that struck me about this pack was its attachment points. A lack of attachment points (non-Velcro) always bugged me about my Simms Headwaters sling packs. There are some items I'd rather have on the outside of my pack. I don't want to open and close zippers all the time. I used the Westwater lumbar pack during last season's shad run and I grew to like it, though it was a bit large and I didn't need to carry around a ton of fly boxes and supplies everywhere I went. I decided to make a switch to a more modular system. 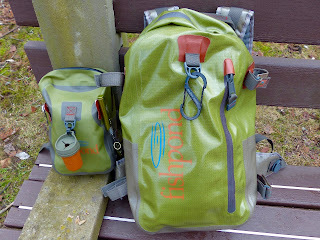 I bought the Fishpond Westwater backpack and chest pack, both of which seem to be discontinued now. The backpack holds all the gear to which I don't need immediate access (e.g. backup flies, extra tippet material, hat and gloves, etc.). I use the chest pack (as a small sling) to carry a couple fly boxes, a leader wallet, some snacks, etc. Despite being small, the chest pack has several attachment points. The chest pack can buckle into the front of the backpack to make it easier to carry on long hikes. I was very impressed with the materials and the construction of both. Neither are submersible, but doth do a great job of keeping rain out. Fishpond uses their proprietary Cyclepond fabric, which is made from recycled nylon fishing nets. It's great to find a company that makes great products in an environmentally responsible way. Onto my chest pack, I attached a Fishpond Piopod micro trash container for wrappers and old leader material. I never littered to begin with, but it was nice to have a place to put garbage instead of stuffing it into the pockets of my waders. I also attached a Fishpond Swivel Retractor with a pair of Barracuda aluminum clippers. I like the way the retractor attached to the pack (with a single, but sturdy pin w/backing piece). The retractor can rotate 360º, so nothing virtually nothing is out of reach. I don't like how the coil dangles loosely, though. I prefer the Simms retractor, which holds the accessory closer and keeps it from rattling around. The Barracuda clippers worked really well. They are very light, sharp, and the blades are replaceable. My one gripe was that they don't work well when cutting off a fly tied with a steering knot (like the Turle knot). Conventional nippers have a beak-like shape which allow them to pull up on the underside of the knot. The Barracuda clipper have trouble with that due to the blade being slightly recessed. If I tied nothing but loop knots and clinch knots, I would buy several pairs of the Barracuda clippers. They will serve me better in the spring and will be ideal for saltwater fishing trips. I also tried the Fishpond Sweetwater reel case, in size large. This is a very well made case and offers good protection from falls (I only dropped it once). The small, zippered compartment was perfect for storing extra leaders. I even found the top of the case was good for sticking a flies in at the end of the day. It is supposed to hold four larger sized reels, but that is a bit of a stretch. When I brought a couple of switch rods and a couple of single handers, it worked fine. 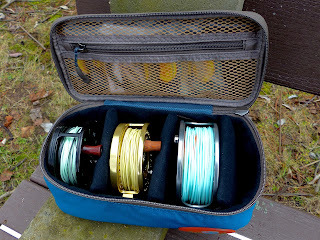 When I packed two switch rods, a spey rod, and one single handed rod, there was no way I could fit all four reels. I know the fit shouldn't be too loose, but it could be a little wider to accommodate four saltwater sized reels. I will probably pick up the extra large size and use the extra space to store a small camera and other small supplies. My most significant Fishpond purchase was a Nomad mid-length net. 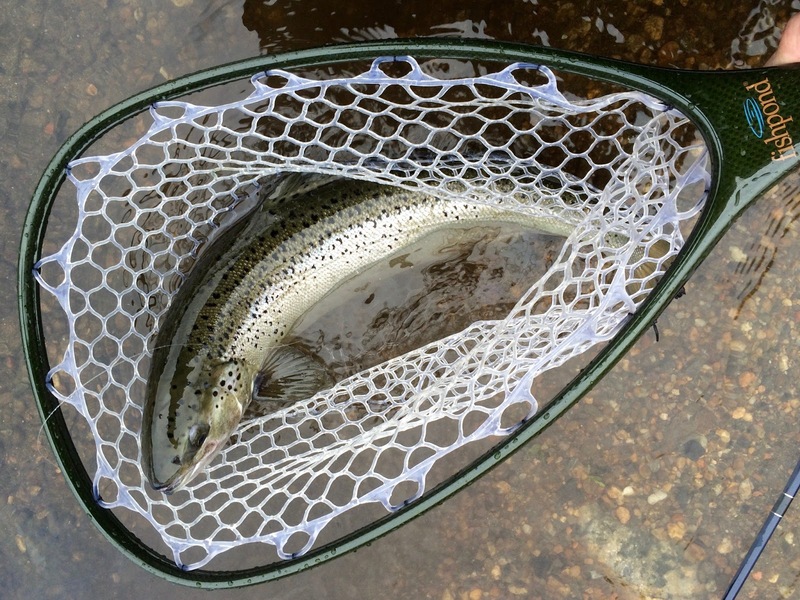 These nets aren't cheap, but they are extremely light and durable. The mid-length net is somewhere between a hand net and boat/guide net. It is 37" in total length and offers a much greater reach than my old Brodin San Juan hand net. The bag is rubber and easy on the fish. It weight less than one pound and causes no fatigue throughout the day. The net floats like a cork. When possible, I found myself dropping it into the slack water when I released fish. It would be right where I left it when I got back. The rubberized handle is easy to grip, even with wet hands. As a bonus, it has a ruler built into the handle. The head is 13"W x 18"L. Virtually all of last season's salmon would fit comfortably in this net. The fish were bigger this season and I had more "tight squeezes" and "no ways" than I would have liked. I would say it the maximum fish length for this net is 24". It might hold a slightly longer fish, but there's not much room for a larger fish to turn. Furthermore, I had to hope a bigger fish will go into the net peacefully, which is not always the case. I will probably try the next size up next season (the El Jefe) just for a little peace of mind. 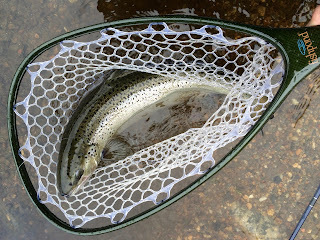 The mid-length net will make a great net for all but the largest sea-run browns and American shad, so I will continue to use it even if I buy a larger net. I got pretty tired of my Nomad net sliding around underneath my wading belt, so I purchased a Smith Creek Net Holster. At $39.99, this is one of those items that seems outrageously expensive for what it is. However, it works so well, I would buy another if I lost mine. I anchored it on my wading belt with one side on each side of my rear belt loop. The key was using a wading belt wide enough to fill the space of the net holster's clip. A 2" wide Simms neoprene wading belt was the perfect fit. The net holster didn't move from right to left and the net stayed perfectly upright and stable. It was very easy to remove the net and replace it when necessary. Like I said, it is expensive for what it is, but it does its job well enough to justify the price. 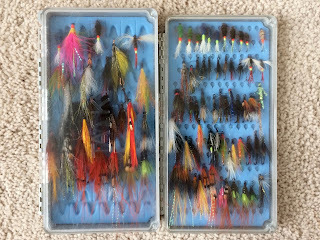 Tacky fly boxes are a great product. I hope they expand their lineup. Everyone has been talking about the Tacky Fly Box, so I bought a couple with an Orvis discount coupon. It was like buying one and getting the other free. I bought the standard box and the Big Bug box. I was skeptical of how good they would be for salmon flies. The standard box, which is definitely more of a trout fly box, worked well as long as the flies were size 6 or smaller, though 8s, 10s, and 12s were a better fit. The Big Bug box held pretty much everything, but its layout is definitely that of a modern streamer box. Tacky guys, if you read this, what we need is a "Steelhead/Salmon" and/or a "Bonefish/Permit" box. The dimensions of the Big Bug box would be fine, but with a layout more like the standard box, but with deeper slits in the silicone. It would be awesome if it could hold flies size 2-10, with anything larger moving to a Big Bug box. I have no complaints about the product though. It is really high quality. It just doesn't totally meet our needs as salmon anglers, which is not really surprising given how small our share of the market is. I have some fly tying tutorials planned, plus some other tips, so check back soon!